Google Answers is pretty controversial amongst webmasters but Google has said time and time again, why they source certain places and it does not substitute the web page itself. In any event, it looks like Google may be getting more click friendly with their answers. 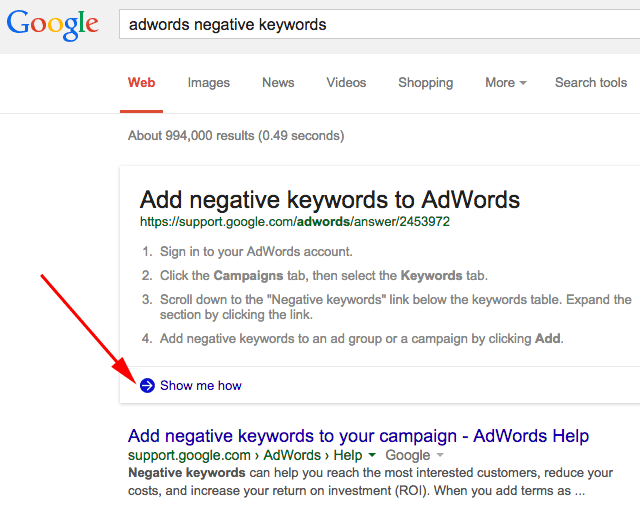 Tommy Sands shared a picture on Google+ of a query for [adwords negative keywords] that shows the answer and a bold blue link with an arrow that reads "Show me how." Clicking on that links takes you to the Google AdWords web page FAQs. I have not been able to replicate this behavior for any other query outside of this AdWords example. I tried close to 25 different answer related queries and nothing yet. I do hope Google does add more encouragement for users to click over to the web page, like they do with the AdWords example.